Take tickling the ivories to a whole new level! 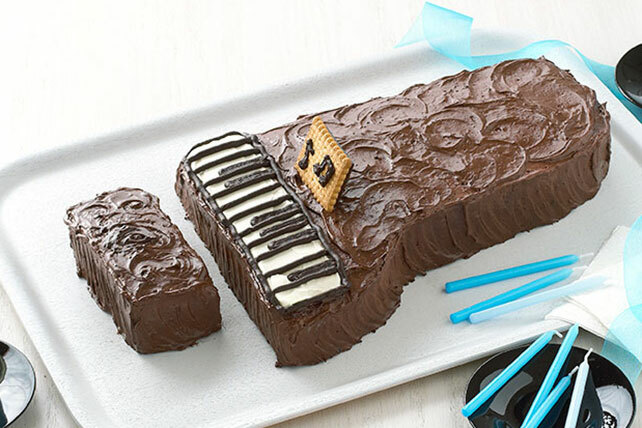 Our Piano Cake is a scrumptious way to celebrate a pianist's birthday or a successful recital. Prepare cake batter and bake as directed on package for 13x9-inch pan, lining pan with foil sprayed with cooking spray before adding batter. Cool cake in pan 15 min. ; invert onto wire rack. Remove pan; cool cake completely. Cut cake into pieces and arrange on platter as shown in diagram for the piano and piano bench; set aside. Discard cake trimmings or reserve for snacking. Beat dry pudding mix, sugar and milk with whisk 2 min. Stir in 1 cup COOL WHIP; use to frost piano and bench pieces. Spread remaining COOL WHIP into rectangle on top of piano as shown in photo. Melt chocolate as directed on package; pour into resealable plastic bag. Seal bag. Cut small piece off 1 bottom corner of bag; use to draw piano keys on cake. Use any remaining chocolate to draw small music notes on cookie; place on cake for sheet music. Refrigerate 30 min. or until glaze is firm. Keep cake refrigerated. This cake will be a hit at your next special occasion. At 12 servings, it makes enough to feed a crowd. For an ivory piano, prepare using a white cake mix and JELL-O Vanilla Flavor Instant Pudding.